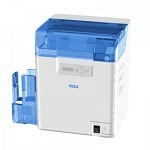 Like all other computer-based printers in the office, today?s photo ID printers are digital. Resolutions of 300 dots per inch (dpi) or more are common in office printers, so the problem of jagged edges is largely a thing of the past. Most photo IDs are printed by digital thermal transfer, a process by which color is transferred from a single-use ribbon to various kinds of receptor materials. The variable size and density of each color dot is the secret to the photo-quality printing possible with dye?sublimation?bright colors and no jagged edges. YMC dyes penetrate the receptor. Color migrates from the dye ribbon into the surface. The spread of the dye dot (its amount of diffusion) depends on the amount of heat applied by the printhead element. On reaching a dye panel boundary, the printhead is lifted to allow the card?to back up. The head then lowers to print the next color. Yellow, magenta and cyan are combined in varying proportions to print photo-quality images. When ?fully saturated?, the three colors together print ?process black? text and graphics, which is similar in appearance to ?black resin printing? (discussed in the next section) but is not infrared readable. The illustration below shows the usual pattern for dye sublimation (?dyesub?) printer ribbons. The K panel is not a dye. It is instead a ?mass transfer? black resin used for infrared readable bar codes and other data. A second K panel (YMCKK) is sometimes provided to allow black resin printing on both sides of the card. An overlay panel?or O panel?is available to protect the image from abrasions and fading. The number quantity number of images per roll varies based on the type of ribbon?or number of panels?and the manufacturer. With a mass transfer panel, the printer cannot control either the ink dot?s size or density which is not good for continuous tone images such as photographs. To create the illusion of continuous tone from discrete dots of ink, printers use a process called dithering, exactly the same behindthe-scenes operation your computer performs any time it sends a picture to the office laser printer. A mass transfer ribbon is a layer of monochrome resin on a thin backing film. The resin is usually black, so this type of printing is also referred to as ?black resin printing.? When heated, the resin is stripped from the backing and deposited as a physical layer on the receptor. 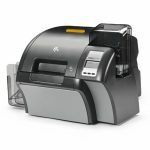 Mass transfer delivers sharp text and graphics plus infrared readable barcodes. 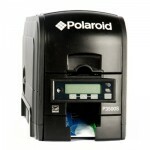 Photo reproduction is adequate for many applications calling for high printing speed and low cost. Using dye sublimination and/or thermal transfer printing methods, heat is used to transfer a digitized image from the ribbon directly to the flat surface of a plastic card. The relatively small number of affordable, durable card materials that accept dyes limits the types of cards used and limits the intensity of colors that DTC can reproduce. 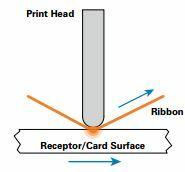 The DTC process depends on uniform, intimate contact between the printhead, the dye ribbon, and the card surface; therefore, uneven card surfaces cannot achieve high color density and uniformity when dye is transferred directly to a card. 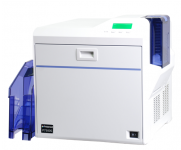 Retransfer printing uses a process called reverse thermal transfer. 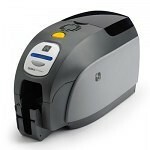 Unlike traditional dye sublimation card printers?which use a printhead to transfer the image through a dye ribbon directly onto the card surface?retransfer printers use a two-step process. 1. 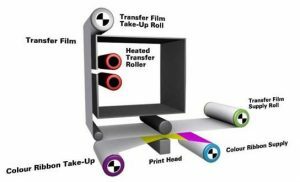 In the first step, the retransfer process prints a high-resolution image in reverse directly onto a clear receiving layer carried by a flexible, intermediate film. The dye sublimation process prints the image to the film, just like in DTC printing. 2. Next, the printer uses heat and pressure to thermally transfer the image and the entire image receiving intermediate film onto the card surface. During this process, the layer thermally bonds to the card surface, and the printed image resides underneath the clear image-receiving layer. This entry was posted in The Basics. Bookmark the permalink.